Welcome to the San Juan del Sur Day School Scholarship Fund! Our mission at San Juan del Sur Day School is to develop inquiring, knowledgeable and compassionate young people who help to create a better and more peaceful world through understanding and respect. SJdS Day School encourages students to become caring and lifelong learners through a curriculum designed for inquiry, critical thinking, open mindedness, cultural understanding and sustainability. We believe that children of all backgrounds deserve this opportunity and have developed the scholarship fund to make this goal attainable. Nicaragua, the poorest country in Central America and the second poorest in the Western Hemisphere, has widespread underemployment and poverty. Though education is a priority for many families, underfunded teaching programs, inexperienced teachers, overcrowded classrooms, and lack of basic infrastructure make quality education a challenge. San Juan del Sur Day School wants to aid in the education of local children so that they learn to be resourceful, international citizens, assisting them in becoming productive members of both their local and global society. Our hope is that these children will not stop with San Juan del Sur Day School, but instead will be inspired to use their education and critical thinking skills to help create jobs at home, learn abroad, teach tolerance, give back to their communities, inspire change and protect our earth’s resources. We hope to help our students to change their future and their story. High quality education can help to transform children, who in turn transform our communities, cities, countries and the world for the benefit of us all. Quality education helps to create citizens who understand politics and can make beneficial changes to governmental systems, people who work together to create strong, open institutions, and societies. The growth of this fund will provide a space for learning for generations to come. Your generosity will enable more students to join others in creating a more just, equitable and sustainable world as they engage in communities throughout the world. Each student, each family has their own story. Yet the common thread for all is the desire to learn. Help us to continue their story by donating to the San Juan del Sur Day School Scholarship Fund. For more information on individual families seeking sponsorship or to recommend a student for sponsorship, please contact Director of Development, Sarah Fahey, at sarah@sanjuandelsurdayschool.com. 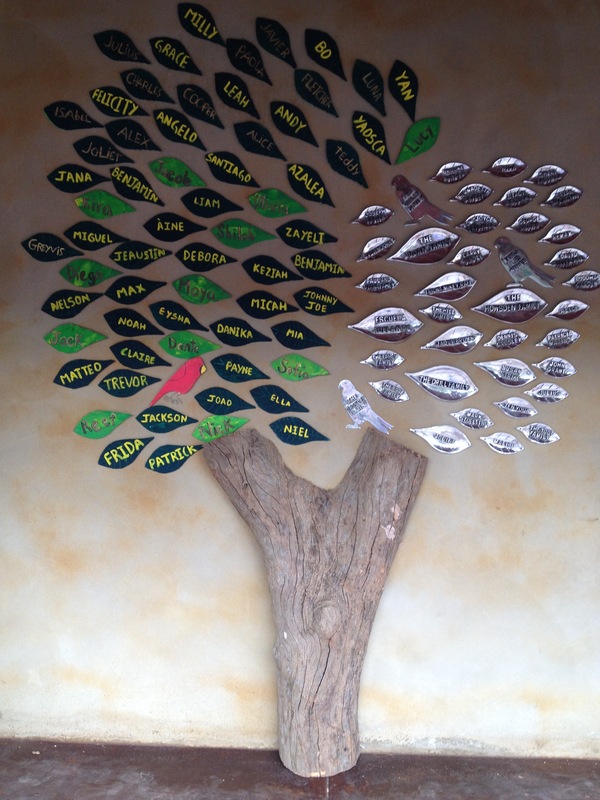 Cash donations of $100 or more will be honored with a special place on the school’s new gratitude tree. The tree is a permanent fixture at the new school and a reminder to all of us that it take a village to raise a child. For more information on investing in our school’s growth, please contact School Director, Julie Speier, at Julie@sanjuandelsurdayschool.com.